Until now, Klout has been the only personal influence measurement tool to track Facebook activity as part of its influence score. 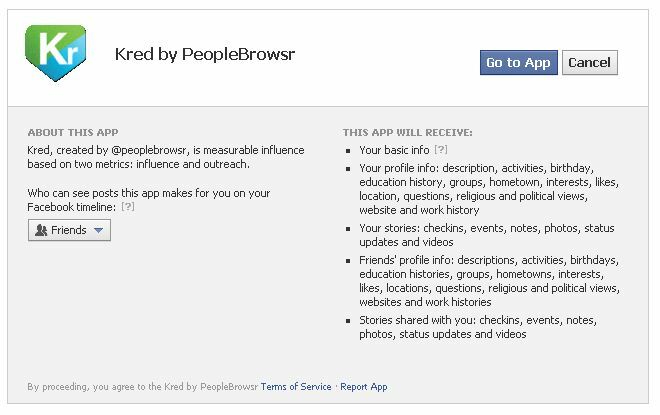 On April 12, that changed: Kred, the influence measurement tool introduced last year by PeopleBrowsr, announced that it would include Facebook activity in its scoring model for users who choose to connect their Facebook accounts. 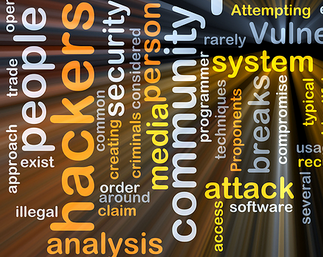 And the company has already made changes to its methodology to avoid a privacy fail. Kred spells out the full rules on how you can earn points for Facebook activity in detail at http://kred.com/rules. 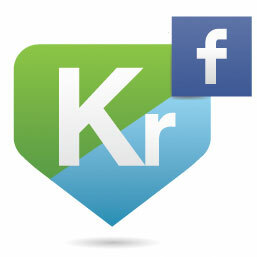 (Users accumulate Kred Points for various social media activities; the Kred influence score is based on those points.) The most valuable activities are when someone else shares or creates content around you, by posting on your wall (20 points), sharing your link (20 points) or mentioning you in a post (10 points). Still, none of these Facebook activities are as valuable as being @mentioned on Twitter by someone with 10,000 followers or more, which is worth 25 points. On Facebook, being mentioned in a in a comment, receiving a comment on a post, or being invited to an event all score 5 Points, and Likes are with 3 Points. 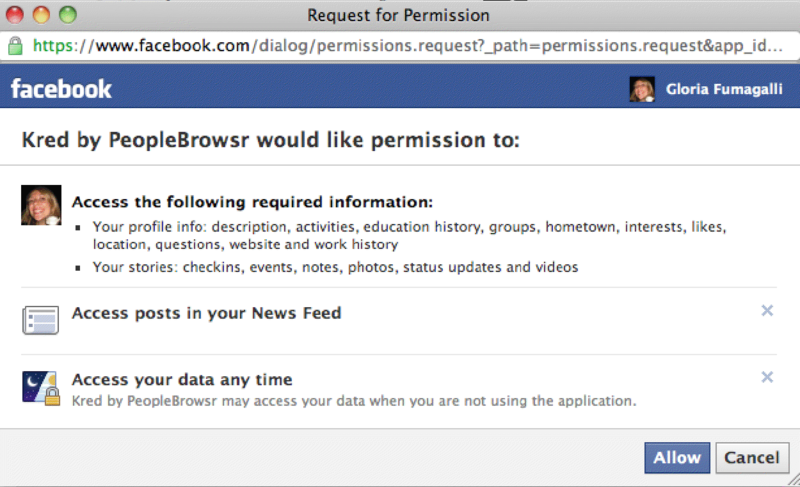 As I have learned first-hand, Facebook privacy permission settings are a tricky thing. Klout had to change the way it managed data from Facebook accounts shortly after it added the platform to its scoring model last fall to be more sensitive to user privacy concerns. Kred is stepping cautiously. Only people who opt in by connecting their Facebook accounts will see Facebook activity tracked by Klout. And its Activity Statements, which track every action and points the action earns toward a user’s score, will show Facebook activity–but while you can see Twitter activity for any Kred user, you can only see Facebook activity tracked on your own Statement. To its credit, Kred quickly changed its approach after I brought this to their attention. Within a week of launching, the company’s engineering team had re-worked the applications so that, when it comes to your Friends, it will “only ask for information that directly affects your Kred Influence and Outreach when & if your friend also connects their Facebook account to their Kred profile. We will no longer ask for personal identifying information from your friends’ profiles including activities, birthdays, education histories, groups, hometowns, interests, likes, locations, questions, religious and political views, websites and work histories,” according to Kred Director of Marketing Communications Shawn Roberts (bold emphasis mine). With the integration of Facebook activity, Kred and Klout now both track activity on social media’s largest social networking platform. For those who believe that personal influence scoring holds a lot of potential value for both users and marketers, it can only be a good thing for these tools to base their analysis on a broader set of data. But this also creates a challenge for the influence measurement tool: getting people to actively opt in. Unlike Twitter, which is inherently a public platform, personal influence measurement tools need users to grant them access to Facebook data. Klout, which integrated Facebook last fall, has not been willing to share information on how many users have opted to do so. Will the promise of a higher score, Perks and Granted Wishes be enough to lure more users? If you’re sold, you can add your Facebook account to your Kred profile at http://kred.com/identity. And stay tuned. CEO Andrew Grill says that he plans to add more social networks and “other indicators of influence” to Kred. 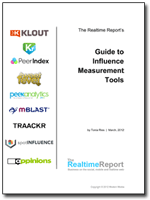 To learn more about influence measurement tools and how they work, check out The Realtime Report’s Guide to Influence Measurement Tools, our detailed analysis of personal and contextual influence measurement tools. Yo. Is It Here To Stay?